Stageco supplied an impressive temporary building, called The Drum, for the production of one of the largest events in Qatar’s Oil and Gas Industry, organised by WRG Qatar LLC in Ras Laffan Industrial City. Qatar Petroleum, Qatargas and RasGas held this prestigious event on December 13, in honour of the three companies’ achievements, when they joined forces to break Middle East records for producing 77 Million tonnes of liquefied natural gas (LNG). 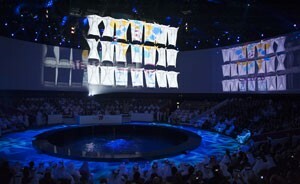 To organise this celebration His Excellency Al-Attiyah established a multiple-discipline 77 Mta Task Force, compromising of representatives from Qatar Petroleum, Qatargas, RasGas, Ras Laffan Industrial City and a higher committee that oversaw all event planning. WRG, a renowned international event and marketing agency, was appointed by the 77 Mta Task Force to be responsible for the entire event management; from the initial creative concept to production, including branding, catering, entertainment and video content. Inspiration for the bespoke venue design was based on the LNG tank and event engineering specialists Stageco, were chosen by WRG to design and build the bespoke event structure, measuring 57m wide and 20m high. Project director Tim Elliott from WRG explains why they chose Stageco for this prestigious event: "We’ve been keen to invest in Stageco’s services since permanently establishing ourselves in Qatar, but haven’t had an appropriate event to do so. The Drum was a perfect opportunity to start the relationship between WRG and Stageco, a relationship we now hope will continue to thrive. WRG are very pleased with the end result of the structure, especially given the timescales we were set by the end client." The precise planning for a build of this nature was essential, with Stageco designing and manufacturing bespoke building parts and ensuring the structure was able to support an overall rigging capacity of 35 tonnes. 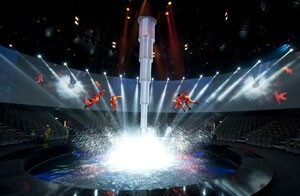 The vast temporary venue included a 1,200 seat auditorium, deep water stage reaching 16m depth in places, with a 5m diameter central stage lift, a 360 degree screen measuring 180m x 9m, along with rigging for 27 aerial performers. A crew of 18 Stageco professionals, led by Dirk De Decker, completed the huge build in just 10 days, overcoming several challenges, from managing logistical operations for such a huge project to building in an industrial zone surrounded by miles of desert. Stageco’s international projects director Dirk comments: "Our involvement with the exciting 77 Mta celebration marks a fantastic start to what we hope is a growing relationship with WRG. It was a real pleasure to work with WRG and we are very proud to have been involved in such a pioneering production. While standards were high throughout, we’ve created an innovatively designed temporary event venue, keeping to challenging time schedules. I’m delighted with the outcome."